I had planted from seed some yellow squash in February successfully according to my zone. The amount of days until plant bared vegetable was successful. 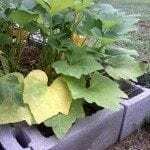 I planted it in a container and saw over 40 flowers and soon had my first yellow squash. After harvesting the first vegetable, the leaves started to wilt and my flowers never produced but 3 more squash. What did I do wrong?